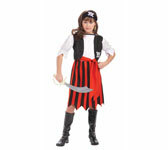 Child, pirate costume, Pirate Lass. Dress with attached vest, Tie belt, Headband. Size: MEDIUM (size: 8-10,for 5-7 years old).